If life is a movie… then DNA is the script but epigenetics is the director. If you started counting the cells in our body, one by one, it would take you at least a million and a half years to complete the task. And yet all this complexity was once contained in a single cell. And as that cell divided, the same genetic material was passed on to each new cell (even as they become more specialised) until you were born. That’s easy enough to write but understanding this process is one of the great adventures of our times. How do the same genes produce such wildly different outcomes as teeth and eyes? The answer lies in epigenetics, the study of what is ‘on’ rather than ‘in’ our genes. Cells produce proteins according to the blueprint carried in our DNA but we are now beginning to understand that other chemicals determine how this blueprint is read by our cells: some genes are turned on and others turned off. 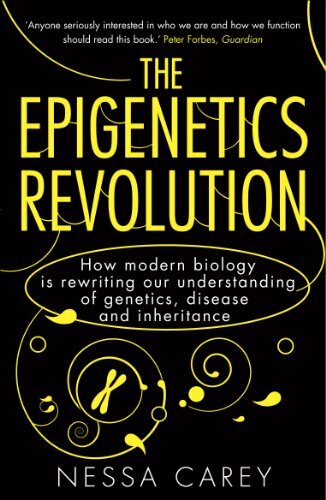 The best explanation of this process comes from Nessa Carey in her 2011 primer, The Epigenetic Revolution. If life is a movie, she explains, then DNA is the script but epigenetics is the director. The way a story is told, what’s left in and out, can lead to quite different films: even with the same basic script, nobody’s going to confuse a Spielberg with a Woody Allen. This switching on and off of our genes also appears to be affected by environment. Two queen cells opened to show queen larvae of the Western honey bee floating in royal jelly. Feed a worker bee royal jelly and she becomes a queen, despite being genetically identical: different genes are being flipped on and off by a chemical compound in the jelly. Even more remarkably some of these changes seem to be passed on to the next generation. Subjecting mice to the stress of electric shocks while wafting them with the strong-smelling chemical acetophenone created a stress response to the chemical, that was passed on to the mice’s grandchildren. But what about humans? The classic study is of the ‘Hunger Winter’ in the Netherlands in 1944 which killed over 20,000 and left thousands malnourished. Children conceived during the famine experienced a life-long increase in their chances of developing obesity and heart disease and this susceptibility was passed on to the next generation. Similar results have been observed in groups of Holocaust survivors and victims of racism: trauma has transgenerational consequences. You don’t have to be a scientist to sense the impact of these studies. The ability to correct or reverse genetic conditions or to scientifically quantify the benefits of diet, exercise and a happy childhood has implications for all of us. But caution is needed. Eating royal jelly isn’t going to cure cancer. Epigenetics confirms what we’ve always known: that the relationship between nature and nurture is mind-bendingly complex and our understanding of the actual processes remains limited. But that’s no reason not to try.